Luxury Private Dining Rooms at Heliot Steak House - Leicester Square, London WC2H 7JH. Thank you for your interest in Heliot Steak House! Heliot Steak House boasts great value USDA prime steaks, aged for between 4 and 6 weeks to develop tenderness and flavour. You can choose from a selection of toppings, including roast bone marrow, truffle and lobster tail, or keep it simple with a choice of eight sauces. If steak isn’t your thing there is plenty more to feast on with a menu created by our award-winning executive chef Ioannis Grammenos , including some excellent fresh fish dishes, succulent main course lamb, duck and pork dishes as well as a comprehensive exciting and innovative range of vegetarian and vegan selection to satisfy every palate and taste. There are six bars throughout The Hippodrome, including Heliot Cocktail Bar, which is the central hub of the casino with a drinks list offering everything from American beers to unique cocktails. The Cranbourn Bar, sited on the third floor adjacent to the two-tier Smoking Terrace, is the West End’s busiest and most popular late night venue. 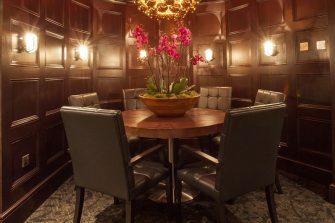 Our two private dining rooms provide an intimate atmosphere for group to have private dinner party and business meetings. Both rooms are spacious and light, perfect for drinks receptions, dinners and meetings and set-ups vary from boardroom to theatre style. It’s a perfect space for groups looking for some different experiences with their clients or friends. We have three private dining menus on offer which can be adjusted according to your dietary requirements. Prices start from £37.50 per person for three course meal. Venue is strictly over 18s only.